If you burn that wood, the process doesn’t emit any extra CO2 into the atmosphere - because the trees removed it from the air in the first place. It’s called carbon neutral. Many scientists believe it will be needed because they don't trust politicians to curb the CO2 emissions that are over-heating the planet. 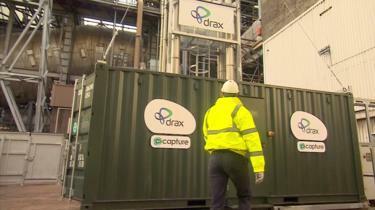 Andy Koss, CEO of Drax Power, admits that its carbon capture pilot is tiny – but says it's an important step towards getting the whole plant capturing its CO2 - and finding a market to use it. “This is a really important technology,” he told us. “We are definitely going to need it if we want to keep within the 1.5C temperature limit proposed by scientists. " Almuth Ernsting from the pressure group Biofuelwatch takes the opposite view. 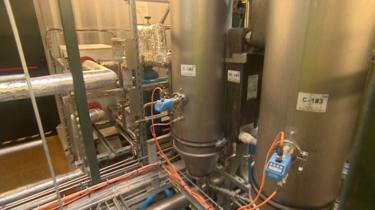 “Burning biomass is absolutely the wrong option for so many reasons,” she said. "Forests are vital for the health of the climate so we need to keep them not burn them. 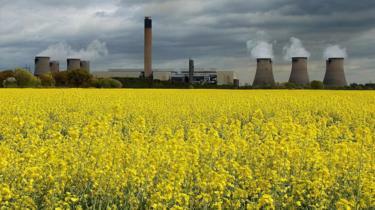 "The Drax experiment is so ridiculously tiny it’s hard to believe it’s not 'greenwash'." Big things have a tiny beginning. Nice "gadget" but somehow I don't know if it's the description by the article, it's not clear what they are supposed to do with the CO2 they "recover". OK: captured CO2 might be reused but it's still CO2. To reduce CO2 content they should dissociate it, convert it to Oxygen and Carbon and apply these products for some useful process; there are thousands of great uses for them. Reusing CO2 you simply won't reduce the final balance of it. Isn't reusing/recycling existing better than just making more? We have hammered into us the importance of recycling/reusing glass, plastics, paper, etc. Is CO2 any different?